In my studio I paint on a large drafting table however I wanted something smaller to use in my classes so I built this simple desktop easel for watercolor painting ( though obviously it can also be used for some of the other mediums). It is useful in a class environment as it stores flat for packing and is reasonably robust. 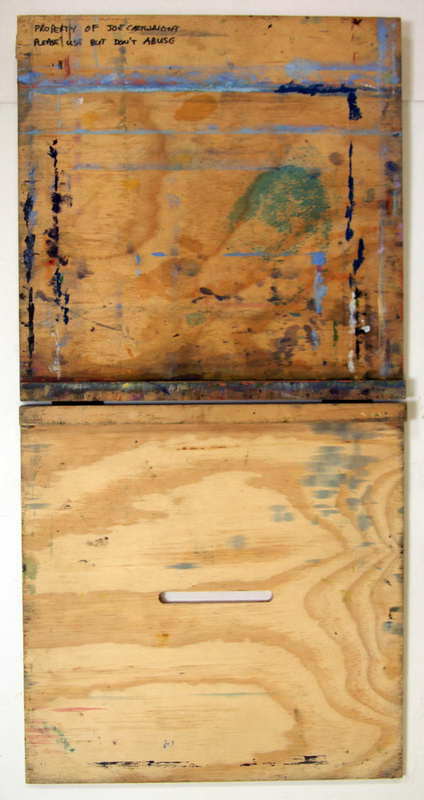 This is an image of my easel from side on. 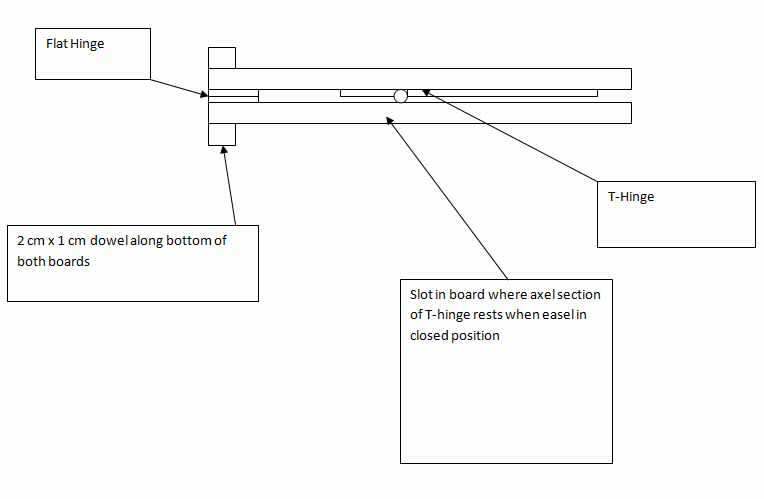 The point of the hinge fits into holes drilled into the base unit, as you lift the top section of the easel the hinge point drops into each successive hole to allow you to quickly change the angle or your board. See how it sits against the table edge so it can’t slide forward when you paint. This desktop easel can be modified for your own purposes. It can be made wider or smaller depending on how large you work. I find it is ideal if you are working on a quarter watercolor sheet (37cm x 27cm or 14.5” x 10.5”). It would probably become to cumbersome if your work is much larger than this. The following two images give you some details about the materials I used for this simple desktop easel. 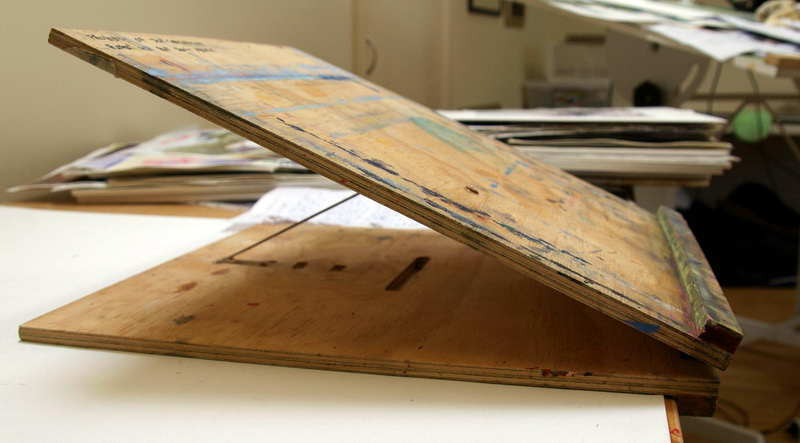 Top view of simple desktop easel with dimensions and materials used. The glue I used to attach the hinge to the board is a two part epoxy. The hinge needs to be strong enough to take the weight of the board and what else you place on it. The board is made from waterproof ply about 5/16th of an inch thickness. If you are not experienced with the tools needed to make the desktop easel I suggest you seek the help of someone who is. Power tools, chisels, etc. can be dangerous in inexperienced hands. Hi Janine, I have added a couple of charts to the bottom of my article which should give you the information your need to make your own desktop easel. Please let me know if you have any futher questions. Thank you so much for all of your great information. Just wondering what brushes you find best for your work? I see you use some of the larger ones. What brand etc. The brand of watercolor brushes I use are made by a Melbourne (Australia) company called NEEF. My brush sizes are 24 largest to 6 smallest. I use as large a size brush as possible for a particular section of painting I am working on. I did write an article on how to choose a good watercolor brush which may be of help to you. Here is the link to that page: Buying watercolor brushes. If you do a search on watercolor brushes on my site you will find some other material on watercolor brushes. Absolutely beautiful paintings and great videos. What angle do you keep your easel? It looks very slight. Also, do you know where I can purchase Neef brushes and that neat palette here in the USA? My easel is usually at around 20 – 30 degrees, sometimes I will have it much higher and at times even flat if I don’t want the watercolor paints to run very much. The angle I choose for my watercolor easel is more based on the type of painting I am tackling. I have made a note to write an article on the angle of the easel when watercolor painting covering when you would use a steeper vs more shallow angle. Once the article is written I will post it on this site. Unfortunately I don’t think NEEF have a retailer in the USA but I am sure there must be similar brushes and palettes over there. You could contact NEEF in Australia who could put you onto a local supplier that may be willing to ship overseas. Thanks for the plans, made it this morning and it’s hanging in the garage with a coat of urethane on it, drying. Made it out of some smooth finished plywood, about 5mm thick. The dimensions I used were 610 x 610 mm as I’m going to use it for my pencil and pen art. 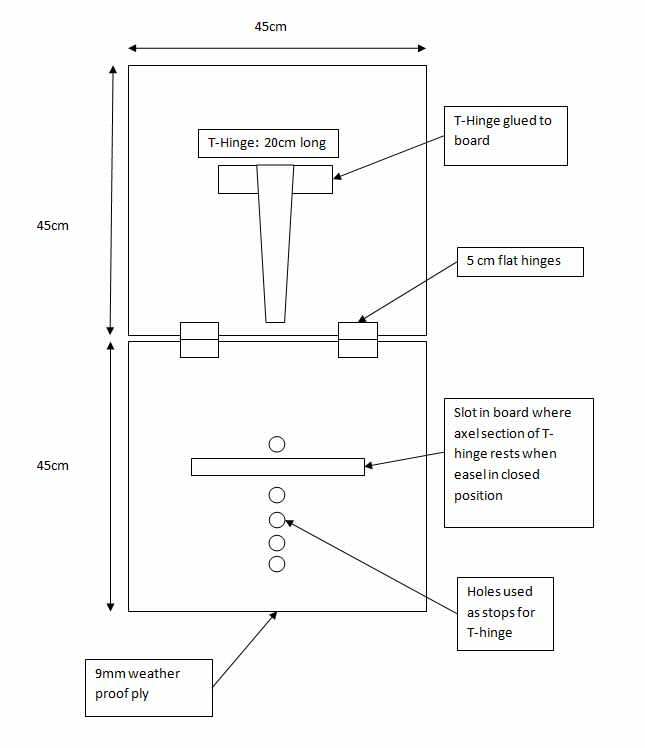 Great plans,simple and effective, worked a treat. Cheers mate. I love your easel design. I am going to try to get someone to make me one. 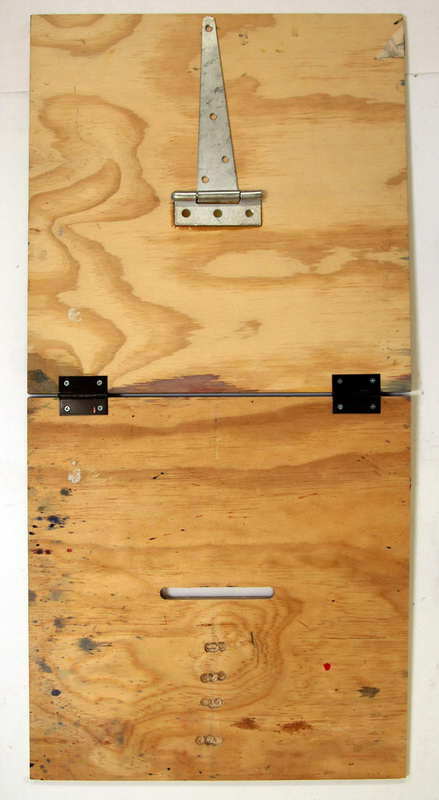 I am confused about on part of this easel. Why does the bottom board have the edge or lip ? Is this necessary? 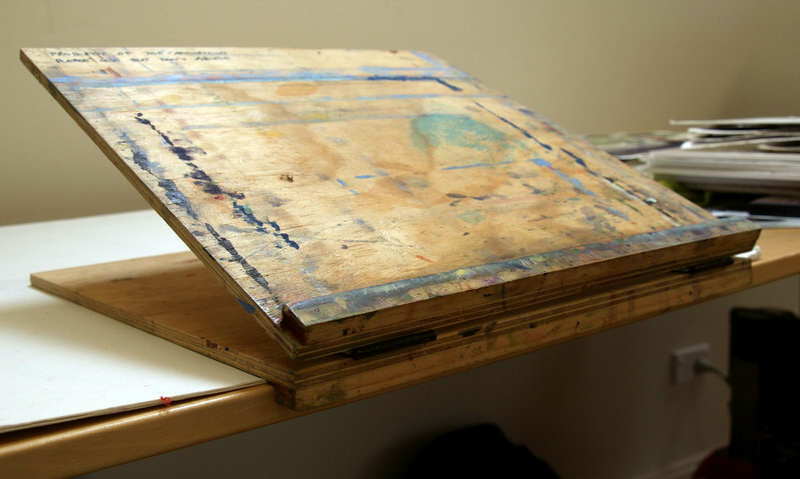 The edge piece of the easel design is there so that the easel will stay at the front of your work table rather than moving when you apply any pressure to it. These hinges have pins too Charles. Just get some that look like the ones in my drawing. Just what I was looking for in my search. OOOooo! Just shared this with my husband, maybe I’ll have a surprise under the tree this year! Thanks for all the fantastic tutorials, info and such! You’re a star!